I can't believe I have almost completed my month with no sugar! It hasn't been nearly as hard as I thought it was going to be (probably because I have been making recipes like this to satisfy my sweets need). It really has been great. I think I feel healthier than I did. It is also nice to have an excuse to not needlessly eat all sorts of junk food (although sometimes I really want to). This caramel sauce was a great find! I was making the dessert for a friend get together and made everything using absolutely no cane sugar. 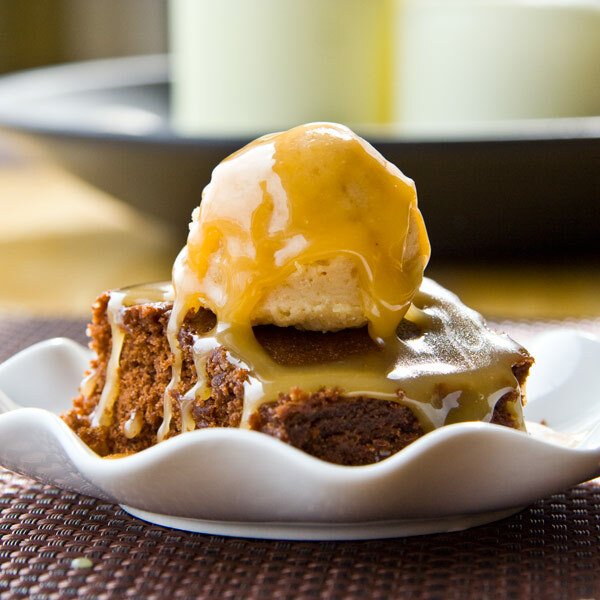 I made my new favorite ice cream - agave sweetened chocolate ice cream, brownies (I'm still working on perfecting this one), and this caramel sauce. Combine honey and cream in a heavy saucepan. Cook stirring constantly over medium-high heat until it reaches 238°. Take off the heat, stir in butter, vanilla and salt. Cool slightly and serve warm, or refrigerate. Microwave briefly to warm for serving. I can think of SO many things I would love to drizzle this over! Looks delicious! Anyways love this post and your blog! I've never thought about using honey to make caramel as I'm soooo used to using sugar! This is an excellent idea that I must try. Oh wow - it's hard to believe this doesn't use any sugar, but that's awesome!